Have you ever watched the movie Interstellar, where the entire planet has turned into a giant “dust bowl” and the human race has to look for a new planet to call home? The degradation of lush, fertile soil to sparsely-vegetated, nutrient-deficient land is known as desertification, and unfortunately has become all too real worldwide, brought about by deforestation, climate change, and mismanagement of the land (through overplowing, overgrazing and overapplication of synthetic fertilizer and pesticides). According to the United Nations Convention to Combat Desertification (UNCCD), some 12 million hectares of land are lost this way each year. And this is exactly why we chose Sadhana Forest as our first cause to support with our 10% For The Planet initiative. During our 2016-2017 travels overseas, we stayed in Auroville, India for the wedding of two very dear friends. While there, we visited Sadhana Forest, a reforestation initiative to restore 70 acres of severely eroded, arid land to the tropical dry evergreen forest it once was many decades ago. The founders, Yorit and Aviram Rozin, began the work in 2003. Since then, they have worked tirelessly with volunteers and villagers in local communities to transform the landscape from barren ground to a lush and vibrant forest and have also helped to raise the water table (underground water level) by 6 metres (20 feet)! The main aim of this project is to support the local rural villages; by raising the water table (water stored underground), Sadhana Forest allows the villagers to cultivate their own food, preventing emigration to nearby city slums. They empower the local youth by providing them with hands-on experience, environmental education about ecological revival and sustainable living, and training in food cultivation. Sadhana Forest was awarded Third Place for the 2010 Humanitarian Water and Food Award. They have since branched out to continue their reforestation and humanitarian work in both Haiti and Kenya. Sadhana Forest Haiti was started in 2010 to establish a huge food forest to create a long-term sustainable solution for the acute problems of the people in Anse-à-Pitre, one of the poorest communities in the world. In 2013, Sadhana Forest Kenya was established to grow food forests together with the Samburu people to help promote food security in an area that is often affected by droughts and malnutrition. In the last fourteen years, Sadhana Forest has trained over 20,000 people in agroforestry and planted more than 140,000 trees, creating water and food security on three continents, and combating climate change worldwide. At Ahimsa Eco Solutions, we stand behind our commitments. We stated that we would be donating 10% of all net sales to organizations doing great work for the environment and social causes, and we are happy to announce that all proceeds from our sales in February and March will be happily given to Sadhana Forest. We look forward to working with them and supporting them in their future endeavors. 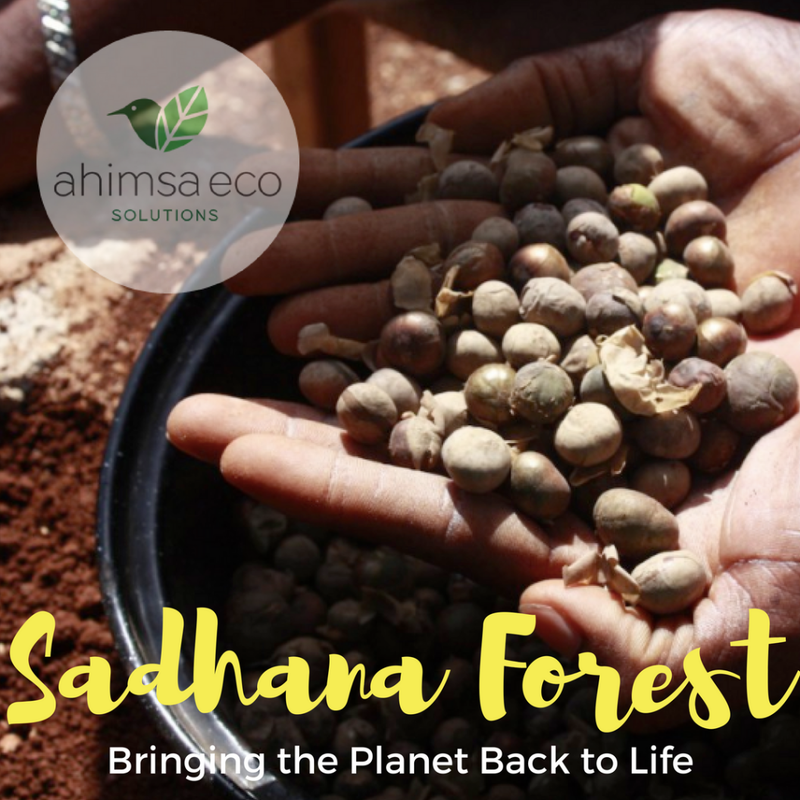 We are delighted to support you, in recognition of all the tremendous work that Sadhana Forest is doing for the planet!